The 2019 World Vision Social Innovation Challenge has launched - apply today! World Vision is launching its 4th Annual Social Innovation Challenge aimed at the best and brightest innovators. The Social Innovation Challenge is an annual pitch competition for innovators looking to make a social impact on the world by creating business solutions that address some of the world’s most difficult development challenges in vulnerable communities. The Social Innovation Challenge provides innovators with an opportunity to develop their business ideas over the course of one-year through ideation support, technical advisory services, and the expertise of World Vision Canada to market test their solutions. Unlike any other pitch competition, SIC is an iterative process whereby entrepreneurs and community members abroad collaborate on solutions to create a bigger impact. The 2018 – 2019 Challenge will tackle the issue of waste disposal in Iloilo City, Philippines. The Social Innovation Challenge pitch competition will take place in Toronto in June 2019. The winning team will receive a grand prize of $25K in seed capital and a 1-year commitment from World Vision Canada for business development support. Applications for the Social Innovation Challenge officially opened on November 1, 2018. Final deadline for submission is February 22, 2019. Updates, resources and the submission portal will be accessible online on the Challenge website. The challenge is open to any entrepreneur at the idea stage of business development. The deadline for nominations is January 14, 2019, and the entire information package, including details on how to make a nomination, can be found here. On August 21, 2018, the Government of Canada released Opportunity for All – Canada's First Poverty Reduction Strategy with the vision of Canada as a world leader in poverty eradication. The Honourable Jean-Yves Duclos, Minister of Families, Children and Social Development is launching a call for applications for membership of an Advisory Council, which would be composed of a Chairperson, a member with particular responsibilities for children’s issues, as well as members who have knowledge and experience of poverty-related issues. It would also include people living in poverty or with lived experience of poverty. The Advisory Council will be representative of Canada's diversity in terms of gender, regions, Indigenous peoples, visible minorities and official languages. The Advisory Council will operate for at least 2 years. Members must be available and willing to participate over the entire period. The performance review is getting a makeover, suggests new research from staffing firm OfficeTeam. More than half of companies in Canada (57%) have updated their performance appraisals within the past two years. Top changes include making the process shorter (47%) and increasing the frequency of feedback (36%). How often are organizations holding reviews? Seven in 10 HR managers (70%) said their company conducts formal staff appraisals at least once a year. Thirty-one percent have these meetings twice a year or quarterly. Canadian companies donate generously to help those coping with natural disasters and community tragedies, but few are increasing budgets to meet these unexpected needs, according to a new study from Imagine Canada. The Corporate Giving in a Changing Canada study finds that, while eight-in-ten companies gave funds to help communities deal with extreme crises, only 19% increased their community investment budgets. A third elected to re-direct funds originally allocated to other charities, and 48% drew funds from community investment budgets dedicated to disaster relief. Of the 54 leading companies studied, 84%t gave funds to at least one major crisis in the past three years. An additional 58% raised money from employees, while 30% donated goods and 24% raised funds from customers. On December 5, CIBC traders and investment advisors – together with clients, celebrities and partner charities - rallied to raise more than $5.7 million for children's charities as part of this year's CIBC Miracle Day. Every year on the first Wednesday in December, CIBC Capital Markets and Wood Gundy employees donate their fees and commissions to help kids around the world access vital support services and programs. CIBC's annual employee-driven event has raised over $100 million in Canada and $250 million globally since 1984, helping transform the lives of children and their families around the world. Updated eligibility criteria: to reflect feedback received from employers and organizations, the eligibility criteria have been changed to set out what is and isn’t eligible for funding. Small businesses with 50 or fewer employees, not-for-profit employers and public sector organizations that can provide good quality summer jobs for youth are invited to apply for funding from the Government of Canada. Employers are strongly encouraged to open an account on the secure Government Grants and Contributions Online Service portal, a one-time process that will allow them to apply for this and other funding opportunities across Employment and Social Development Canada. The YMCA Post Secondary Youth Internship Program is seeking employer partners to work with their program to connect recent post-secondary graduates to jobs in their field of study. The YMCA Post Secondary Youth Internship program is able to provide up to 16 week subsidies for work placements that start between now and January 21st, 2019. A wage subsidy provided by the federal government that provides $8.00 per hour of participant’s wages based on a minimum hourly rate of pay of $16 hour. The dynamism, energy, dedication, and commitment that a post-secondary graduate brings to work! If you are interested in participating as an employer partner in the Post Secondary Youth Internship Program or have any further questions please feel free to contact Luc Desrochers at Cellular: (778) 386-0853, Email: luc.desrochers@gv.ymca.ca or Jonah Erickson at (604) 328-9622, Email: jonah.erickson@gv.ymca.ca. National Volunteer Week (NVW) is a time to celebrate and thank Canada’s 12.7 million volunteers. 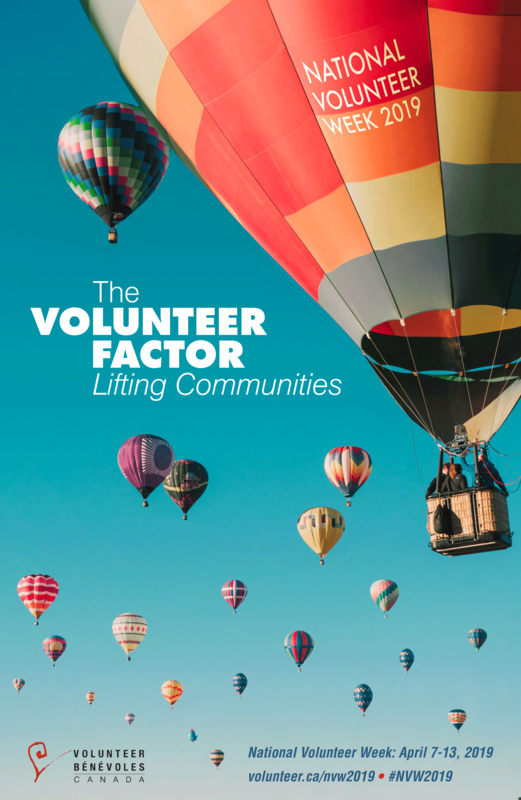 This year's theme is: “The Volunteer Factor – Lifting Communities.” The Volunteer Factor celebrates and recognizes the exponential impact of volunteers and how they lift our communities. The beautiful image of the hot air balloons of different sizes, shapes and colours reflects the diversity of community volunteers. It illustrates that when people volunteer together, the sky is the limit, in terms of what they can achieve. Click here to download the poster. More tools and information for the campaign are coming soon. Thank you to everyone who participated in the 2019 CharityVillage Canadian Nonprofit Sector Salary & Benefits Survey over the past month! We are very pleased to announce the winner of the prize draw: Melissa From, CEO of JA Southern Alberta! Congratulations, Melissa, for winning the $1,000 donation to your organization. As a reminder, all participants have the opportunity to purchase the forthcoming report at a 50% discount off the original price. For those that haven't yet purchased, watch for an email in January with more information on how to do this. The report will be published early next year, so watch for an announcement with the publication date, and be sure to register for our February 21 webinar where we will introduce the report and give you tips on how to best put it to use. The Canadian Online Fundraising Scorecard is a study by fundraising research lab NextAfter that looks at charitable giving in Canada by capturing and analyzing the online fundraising habits and donor experiences of 152 Canadian charities. Instead of asking donors what their online giving experience was like, NextAfter became the donor by first signing up for email communications from each organization, monitored the emails they received, and then when/if asked, made a $25 donation tracking, capturing, and scoring each process along the way. In this report, you'll learn from 152 Canadian charities as well as some real, documented experiments to gain new ideas and insights to improve your email signup process, email fundraising strategy, and overall online giving experience. Get the full report, for free, at bit.ly/canadianscorecard. Canada celebrated the tremendous contributions of 21 recipients at the Canada’s Volunteer Awards ceremony in Ottawa. This year’s ceremony specially marked the celebration of Canada’s150th anniversary of Confederation through the expansion of the Emerging Leader category to recognize five recipients, and the creation of the CVA Alumni, a group of all past recipients. The Honourable Jean-Yves Duclos, Minister of Families, Children and Social Development, gave out the awards recognizing the accomplishments of deserving individuals, businesses and not-for-profit organizations that volunteer their time and make a difference in their communities. The recipients have identified an eligible not-for-profit organization which will receive a grant for either $5,000 or $10,000, depending on the award category. Today, the Honourable Maryam Monsef, Minister of Status of Women Canada, officially unveiled the Gender-Based Violence Knowledge Centre at an event held at Western University’s Centre for Research & Education on Violence Against Women and Children. The GBV Knowledge Centre, housed within Status of Women Canada, will coordinate federal actions under the three pillars of Canada’s first-ever federal Strategy to Prevent and Address Gender-Based Violence: prevention, support for survivors and their families, and the promotion of responsive legal and justice systems. This new online platform is intended for everyone who has an interest in ending gender-based violence, which may include decision makers, service providers, GBV sector organizations, academia, all orders of government, civil society organizations, students, youth, survivors and Canadians. Minister Monsef also announced up to $5 million in funding for GBV and gender equality research projects, as part of a new Call for Proposals to support evidence-based policy and programs. The call also indicates Status of Women Canada’s interest in projects that are Indigenous-led or co-created to meet the diverse needs of their communities. Findings will be shared on the GBV Knowledge Centre online platform. Over the coming months, the GBV Knowledge Centre will continue to expand and evolve, as feedback from users will inform and refine the platform. The goal of the GBV Knowledge Centre is to become a trusted source for reliable research, data and reporting, on potential issues and promising solutions to prevent and address GBV. L’Oréal Paris Women of Worth honours extraordinary women who selflessly volunteer their time to serve their communities. The signature philanthropic program embodies the L’Oréal Paris tenet that ‘Every Woman Is Worth It’ by elevating women who find beauty in giving back. From now through January 8th, 2019 Canadians are encouraged to visit womenofworth.ca to nominate a volunteer, philanthropist or change-maker to be given the chance to receive a $10,000 donation on behalf of their cause. Honourees will be celebrated on International Women’s Day (March 8) at a star-studded gala in Toronto, hosted by one of L’Oréal Paris’ notable spokeswomen. Last year, Dame Helen Mirren hosted this event, so this year attendees can expect someone just as inspirational. Last month saw the launch the 11th Annual DoGooder Video Awards, supported by partners at NTEN and Gather Voices. The DoGooder Video Awards celebrate and honor the best work from people and organizations that are using video to create real impact for important causes. This year is a brand new award category: The 1-Minute Story Award. This award is a way to engage nonprofit practitioners in real-time storytelling by having them record their most powerful 1-minute story of why they DoGood. In addition to the 1-Minute Story Award, we will also bring back the ever-popular Funny for Good Award, Best Nonprofit Video Award and the Fundraising for Good Award. The video submission period will remain open for all three categories from December 1, 2018 until January 16, 2019. The public will then have the opportunity to view the finalists, selected by a panel of expert judges, and vote for the best video in each category from February 1 - March 1, 2019. The winning videos in each category receive a free registration to next year’s Nonprofit Technology Conference (NTC), in 2020, and will also be recognized at the 2019 conference, in front of thousands of nonprofit peers. Organizations and individuals can enter the contest by going to www.dogooder.tv. The Government of Canada is accepting applications from organizations interested in receiving contribution funding from the pan-Canadian stream of the New Horizons for Seniors Program (NHSP). Eligible organizations can apply for $500,000 to $5 million for a project consisting of a 3 to 5 year collective impact initiative. The pan-Canadian stream of the NHSP has approximatively $8 million available per year for five years to distribute to eligible organizations. It is anticipated that up to ten organizations submitting collective impact initiatives will receive funding through this process. Through this call for concepts process (CFC), the Government of Canada will fund initiatives that will support the development and implementation of collaborative approaches to increase the social inclusion of seniors. Social inclusion is the ability to fully participate in, contribute to and benefit from all aspects of society. The deadline for the call for concepts is January 21, 2019. Equal Parts Studio is launching the “Equal Parts Studio Graphic Design Grant for Local Impact.” The initiative supports a Toronto-based nonprofit or charity committed to environment, social justice, advocacy or arts and culture by delivering in-kind graphic design services of up to $18,000 throughout 2019. Applications are open until December 21st, with the recipient announced on January 15, 2019. For more information click here. Today, Vancouver International Airport (YVR) received the ‘Accessibility Certified Gold’ rating under the Rick Hansen Foundation Accessibility Certification™ (RHFAC) program. YVR is the first airport to receive the rating and is the highest rated building in the program. The RHFAC is the first program to measure the level of meaningful access beyond building code, and is based upon the holistic user experience of people with varying disabilities affecting their mobility, vision and hearing. To date, over 1,100 buildings across BC are registered to be rated. The Agency will work with the new Indigenous Advisory Committee to develop approaches for ongoing policy engagement that builds on the input and recommendations received throughout the review of environmental and regulatory processes. Applicants are encouraged to submit their proposals by January 14, 2019. Recipients and the amount of funding allocated will be announced at a later date. Intact Financial Corporation today announced it is committing $1 million to the Roméo Dallaire Child Soldiers Initiative to support the establishment of a regional centre of training and learning in Rwanda. The regional hub of practice, research and advocacy will serve as a meeting place for countries to exchange and learn how to prevent the recruitment and use of child soldiers. The $1 million donation builds on Intact's initial investment of $300,000 in the Dallaire Initiative, which began in 2015. These new funds will help the Dallaire Initiative establish a permanent presence in Africa.